Happy Monday and Happy August! Don’t get me started on the fact that it’s already AUGUST. This year has flown right on by but hey, life happens. Moving along to one of my favorite little tricks. I’m all about making life just bit easier, and any shortcut I discover that benefits me is worth sharing with ya’ll. Helps reduce inflammation- believe it or not, it will decrease the acidity in your body, which is where disease states occur. It removes uric acid from your joints which is one of the main causes of inflammation. Aids in digestion- encourages healthy digestion by loosening toxins in your digestive track and helps relieve symptoms such as heartburn and bloating. Cleanses your system- helps flush out toxins by enhancing enzyme function. Boosts immunity- Vitamin C is BFF with the immune system, and lemons are full of it. I’ve made lemon water a part of my daily routine, but how annoying is it to cut up lemons every morning? Fresh lemon juice doesn’t stay good in the fridge for very long…. and sure you could cheat and use bottled lemon juice, but preservatives aren’t my thing. Soooooo I like taking matters into my own hands. 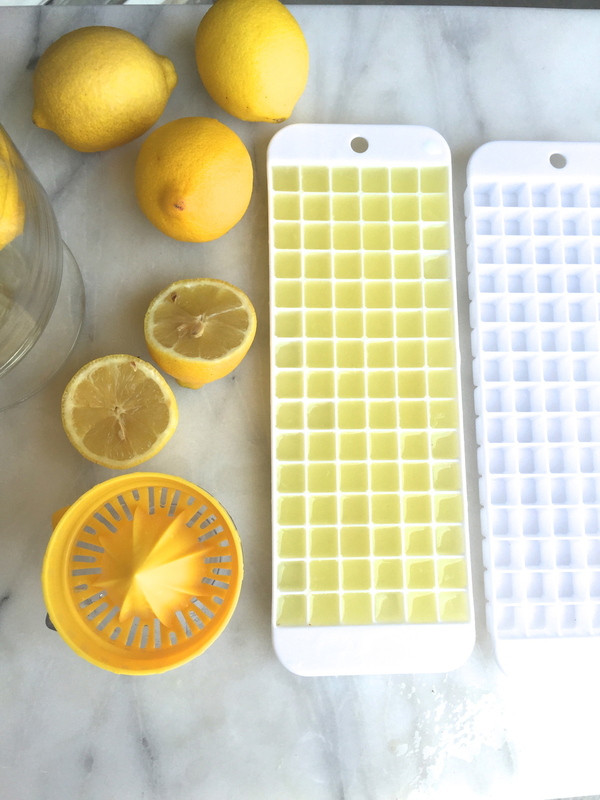 I present to you: lemon cubettes. How cute are these ice cube trays!? Why is everything miniature so adorable? I guess if you’re using a big ice cube tray, all you’ll need is 1 cube which comes out to a little over half of a medium sized lemon. Pop a few cubes into you water jug and you’ll have cold, fresh lemon water on the go! Any other daily healthy shortcuts I can steal from ya’ll!? Tell tell.